Are you a cheesecake lover? If you love the smooth, creamy taste of the decadent dessert then you've probably dined at the Cheesecake Factory. The restaurant is known for its large indulgent portions and over-the-top sweet treats. But Cheesecake Factory nutrition data is hard to find, so if you're trying to eat a healthy diet or watch your weight it can be hard to make smart choices when you eat there. One reason that eating at the Cheesecake Factory can be challenging for healthy eaters is that menu is huge. The appetizer, entree, dessert, and drink choices fill gigantic page after gigantic page of an oversized booklet. You'll find almost every style of food listed: pasta, flatbread (pizza), traditional American fare, salads, seafood, popular Asian specialties, sandwiches, burgers, and steaks. The restaurant also serves Sunday Brunch with foods including pancakes, waffles, omelets, and eggs Benedict. Next, the entrees are very large. For that reason, the calorie counts on most selections are going to be higher than you might expect. For example, the Chicken Salad Sandwich at Cheesecake Factory reportedly provides 1480 calories and 23 grams of saturated fat. A typical chicken salad sandwich that you make at home usually provides 300 to 500 calories and closer to 10 grams of fat. If you're hungry for pasta, you'll find many selections on the menu. A lunch-sized portion of Spaghetti and Meatballs at the Cheesecake Factory provides about 1440 calories. The same dish that you make at home is likely to contain closer to 500 calories, depending on the size and the ingredients. Lastly, the Cheesecake Factory menu is hard for diners who are watching their waistlines. Calorie counts and other Cheesecake Factory nutrition facts are not listed on menus at most locations. So, as you scan the menu, you can't make decisions based on real data. The restaurant also does not list nutrition data on its website. The company states that they use fresh, high-quality ingredients, but choose not to provide customers with additional information regarding calories. They do, however, provide calories on menus where they are required to do so by law. Calorie counts listed here are based on data provided by consumers who visited the restaurant in select states and shared nutrition data with online sources. 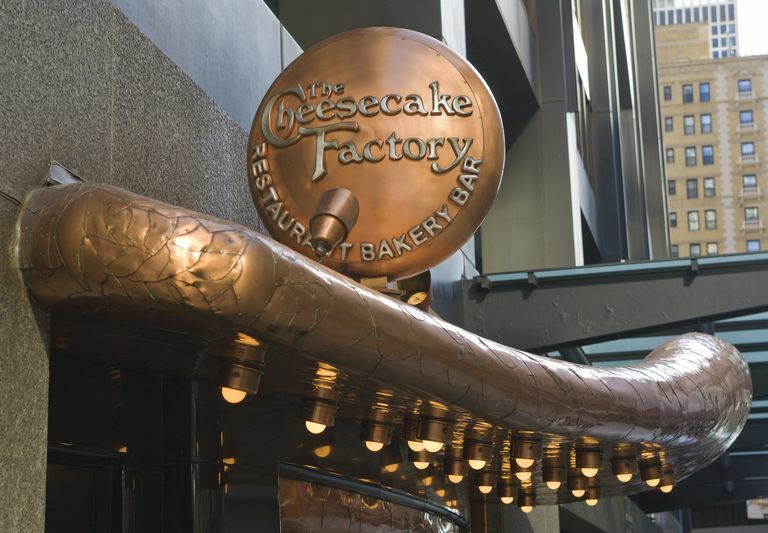 As you might expect, many diners visit the Cheesecake Factory for their signature desserts. In keeping with the restaurant's reputation, each serving of dessert is quite large. So, as you scan the calories counts for Cheesecake Factory desserts, keep in mind that each treat can probably satisfy the sweet tooth of more than one diner in your group. Cheesecake is not the only option for dessert when visiting the Cheesecake Factory. You'll find popular desserts like Strawberry Shortcake (1340 calories), Warm Apple Crisp (1740 calories), and Chocolate Tower Truffle Cake (1810 calories). Ice cream treats range in calories from 600 (for a bowl of vanilla ice cream) to 1230 calories for a Godiva Chocolate Brownie Sundae that can serve several diners. Even though most of the entree and dessert calorie counts are quite high, it is not impossible to find healthier, lower calorie selections on the Cheesecake Factory menu. The restaurant's Skinnylicious menu is full of appetizers, small plates, salads, and snacks that provide smarter choices if you are watching your waistline. For example, the Skinnylicious French Country Salad provides 580 calories. The Skinnylicious Caesar contains about 530 calories. Both are entree-sized salads. If you prefer a healthy dish that is even lower in calories, you'll have to select a smaller salad like the Little House Salad (320 calories) or the Endive Salad (420 calories). You might also enjoy the appetizer-sized Mexican Chicken Lettuce Wrap Tacos (260 calories). So what do you choose for dessert if you want to maintain a healthier diet? The smartest choice is simply a bowl of fresh strawberries (250 calories) or a bowl of ice cream. The healthiest cheesecake at Cheesecake Factory is the original style or Tiramisu Cheesecake (900 calories). If you are a low-carb eater, there are a few selections that may fit your diet. The Ahi Carpaccio appetizer will add only 13 grams of carbohydrate to your daily total. And a lunch-sized Green Salad will add only 8 grams. If you're hungry for dessert, both the plain low-carb cheesecake and the strawberry low-carb cheesecake each have about 40-42 grams of carbohydrate, but only 11 net carbs. Gluten-free selections are also widely available on the Cheesecake Factory menu. Almost every standard entree on the Cheesecake Factory menu provides over 1000 calories. Many provide over 2000 calories. If you eat a typical 2000-calorie per day diet, that means you'll consume a day's worth of energy in a single meal—without counting the cheesecake! So what are the worst choices on the Cheesecake Factory menu? Most of the pasta dishes are very high in fat and calories. One order of Fettuccine Alfredo with Chicken contains 2660 calories and 1595 milligrams of sodium. Pasta Carbonara with Chicken provides 2640 calories and 2569 milligrams of sodium. As a basis of reference, the American Heart Association recommends that the average American consume no more than 2,300 milligrams of sodium per day. And what about the cheesecake selections? The highest calorie Cheesecake Factory cheesecakes include the Ultimate Red Velvet Cake Cheesecake (1570 calories), the Toasted Marshmallow S'mores Galore (1540 calories), the Oreo Dream Extreme Cheesecake (1520 calories), and the Reese's Peanut Butter Chocolate Cake Cheesecake (1510 calories). If you love an indulgent experience, like a special meal at the Cheesecake Factory, there's no reason not to enjoy it once in a while. But if you are trying to slim down or if you are watching your fat intake, you might have a hard time sticking to your diet at this restaurant. Your best bet might be to order a small, veggie-based appetizer or two as your entree, then ask for an extra fork when your dining companion orders dessert. Enjoy a bite or two of the creamy treat and be done. You'll still be able to experience the flavor of the dessert without putting your commitment to a healthy eating plan at risk.